Great tutorial! I’m always struggling with decorating my mantel. Thanks for the tips. Babs – I’m so glad that you stopped by for a visit and took the time to leave me a comment!! I loved your tutorial on how to decorate a mantel. I think that will help me, usually I try to put so many things on the mantel that it ends up looking cluttered. Thanks again. I’m so glad you found it helpful! Good luck with your project! Just what I needed! Pinned! Do the same principles apply to an entryway/console table? Thank you! I found this post via Pinterest, and I will be using it to decorate my mantle. We just moved into a new house and I FINALLY have a fireplace…but I have no idea how to decorate it! This will be very helpful. I also found this post through Pinterest. I have been going mad trying to find a way to decorate my mantel. This is so helpful, thank you! One question: I have a corner fireplace with a deep mantel area (~25″ at the deepest point). Do all the same rules apply, or is there anything else to consider with that? I love your blog and your taste. It’s simply amazing. I have a quick question if u don’t mind. I have a three sided fireplace with a very wide mantel . It’s driving me crazy as I am unable to decorate it the right way. Would appreciate it if u could give me some tips. Hi Zeina – Thank you for your kind words! Do you mean “wide” as in the length left to right or are you referring to the depth? Decorating is a foreign language to me. I appreciate your tutorial. Looking forward to putting the lesson into practice and turning our house into a home. I, too, love your home and your taste….I am looking for something like the giant mirror clock…would you be willing to share where you found it? Thank you so much! I found it at HomeGoods a long time ago and haven’t ever come across another one like it. Restoration Hardware has a somewhat similar version (although it might be convex) but that’s the only one that I’ve found so far that is similar. So sorry that I couldn’t be of more help! How do you accommodate for a fireplace that is off center in a room with a cathedral ceiling? My fireplace is left of center of the wall that changed height. The wall space above greatly changes from one end to the other. I appreciate any tips! I’m finding a balance challenging. I love your ideas….how can I access more? Kim is possible that you can let me have a full picture off the whole green and white fireplace from a bit further back please ? I really want to do mine like that…..Stunning! You have a beautiful home, thank you so much for sharing it with us! We have just purchased our first home and our new fireplace arrived today, this mirror is perfect! Can I ask where it’s from or if you know anywhere that makes similar? Thank you! Hi Ayisha – Congratulations!!! How exciting!! I purchases that mirror at HomeGoods and I’ve never seen one just like it again, but I do know that Restoration Hardware sells a similar (but expensive) one. Good luck and enjoy your new home!! I love the mirror clock that is above your fireplace! Where did you get it! Your house is beautiful!! Where can I get the mirror with the clock printed on it? Hi Samantha – I bought the mirror at HomeGoods a few years ago and I’ve never come across anything similar since. Sorry that I couldn’t be of more help!! Hi! 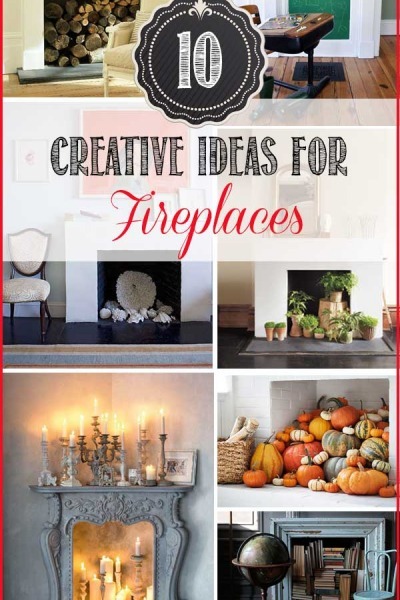 Love the basket (holding birch logs) on the fireplace in the first photo – where did you find it? i LOVE your home. It is gorgeous. If you don’t mind me asking, where did you find a pear branch spray, that is on your mantle. I have been looking every where ( online & in store) for a pear branch or lemon branch spray with no luck. All I have been able to find is packs of 16+ which are almost $200. But I only need one. Kim – I love all your decorating tips – I’m struggling with my mantle. It is very long and not sure what to do with it. If I were to send you a picture would you be able to give me some suggestions??? Hi- thanks for sharing the information. 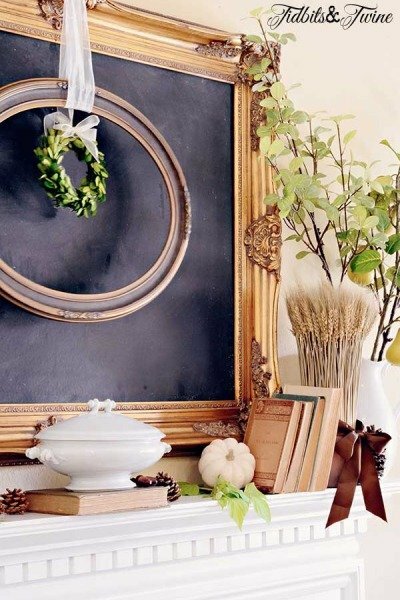 I am on the hunt for the Roman numeral mirror featured above- can you share where it is sold? Beautiful display! Where did you get the oversized clock face on the mirror that is used as the anchor?